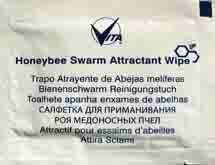 Vita’s Honeybee Swarm Attractant Wipe comes in a small sachet and resembles a cleansing wipe. It is impregnated with essential oils extracted from plants that are harmless to honeybees. 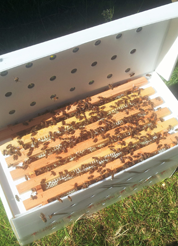 To activate, the sachet can be pierced or torn open and hung in an empty hive, skep or other suitable container, or it can be wiped over the surface of the container. 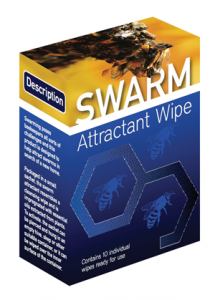 This swarm attractant wipe helps to attract passing swarms, and to lure swarms temporarily hanging in trees and other awkward places into a skep or box containing the swarm attractant. You can also use it as a contingency plan to reduce the risk of the swarm leaving your apiary by setting up a bait hive the the attractant wipe.